February 2010- This page is old and needs an update. The information is good, and there have never been any safety problems with Overdrive, but I'd like to get around to providing better pics here. There haven't been any safety problems with Overdrive because it's simply a continuation of the main blade. It engages the ice and acts in exactly the same way but to a smaller degree. the same as the main blade. how the main blade would act and then reduce the effect. Could you sprain your ankle? Any goalie whose skates have been too sharp has had this painful experience but, this happens when the outside edge of the main blade catches. Overdrive sits on the inside of the foot which makes all the difference. To damage the ankle, the foot must roll to the outside (arrow). However, that would roll you off of Overdrive. Will it lock on a twist? The nightmare scenario is like when a football player’s cleats lock as his foot twists. It won't happen with Overdrive though as you'll simply pivot. Will it lock on a shuffle? If the blade is engaged like in the drawing and you want to shuffle left or right, keeping the blade engaged will result in some minor scraping. If you don't want it, simply raise the ankle to disengage the blade. Will it lock on a butterfly? On most butterflies, the feet stay in one spot and you simply roll the knees forward and down. You are rolling with both blades, not against them (also see photo of skate, above) so nothing changes. If you're standing with the blades engaged and want to slide one or both feet out, a quick roll of the ankles releases the feet. It's easy because in a butterfly stance there’s a lot of outward pressure on the feet (arrows). Will it lock on a kick? The slide box shows how the blade works on a kick. You may notice some very minor scraping on one foot or the other at the beginning but it will disappear after a day or two. As the foot slides out, the toe naturally lifts up to relieve pressure on the groin and knee. A kicking foot carries very little weight so adjusting the foot out of the way is easy. Will it lock on a slide? It can if you want. If you're sliding into the blade, you can lock your foot and use the blade to get up with like in the strip below. The blade is grabbing in the 4th shot. This is a common move with or without Overdrive. The difference with Overdrive is that the leg doesn't have to angle up as high. If you're new to the blade, you may not be used to it working at the lower angle and inadvertantly catch it when you want to slide out. Between the 2nd and 3rd frame (below) is where the left foot might scrape through the blade. If you get it, just practice the move a few times and it'll go away. The photo shows how the heel of the main blade can catch to an even lower angle than Overdrive. Prior to use, goalies are often concerned about how the blade will affect their play and whether it will change their movement in any way. They wonder if they'll trip or stumble or skate funny. These are natural concerns that are easily dispensed with once they get on the ice. The goalies quickly realize that the blade doesn't restrict their movement in any way and poses no risk to their safety. The blade is not sharpened. Almost anything will cut if enough pressure is applied but Overdrive is quite dull so some impact would be required to break skin. Any cut would be limited to the 1/16” that Overdrive protrudes. There is no advantage to having Overdrive stick farther out because that reduces the effectiveness of the main blade by taking you off of it earlier. The blade is well hidden. Most pads keep Overdrive out of sight (#1). 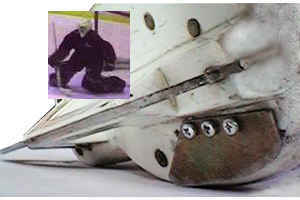 Only when the foot rolls to the side and the ice pushes the pad up does the edge get exposed (#2). If the pads didn't lift out of the way, they would lever you off of your main blade and mobility would be severely reduced (#3). 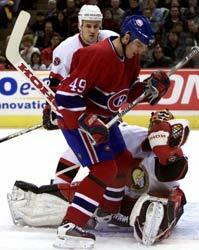 If a goalie goes down with the toes up, the pads will stay down and cover most of the working edge. On the face of it, it’s amazing that with all the action around the crease, no one has been cut by a main goalie skate blade (at least I’ve never heard of it). I would think it’s because most goalie moves keep the blades safely away from danger. The same would apply to Overdrive. 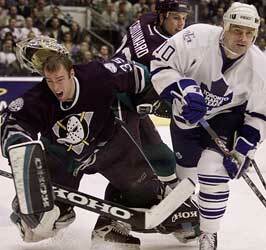 The blade presents no danger to players when the goalie is standing, in the butterfly or in the ½ butterfly. In fact, the only times when the blade could present itself to a player is when the goalie has his feet pointed up; a position that goalies want to get out of as soon as possible. Again, when the feet are positioned in this way, the pads are usually down and covering some if not all of Overdrive. 4- goaltender positioning rarely exposes that part of the foot to other players.